The sound – the foundation of the musical language. Music is the art of sound. With the help of sound, composers and performers are expressing thoughts, ideas, feelings, reflecting the harmony and the disharmony, the beauty and the ugliness, the happiness and the sadness present in this world. Every epoch, every musical era has its style, its particularities, its aesthetics, its beliefs. How can you play Chopin and Mozart using the same color of the sound or the same type of phrasing? Or, can you imagine playing the expressive Rachmaninoff and the sarcastic Prokofiev with the same attitude? Even modern music has its own unique kaleidoscope: what it would be like playing Stravinsky and symphonic rock with the same touché? Ok, maybe it would be original to play Stravinsky in a sympho-rock style or Bach with a touch of jazz (I’ll write more about the crossroads between classical and modern music in my future posts), but I’m sure you understand what I mean :). In order to be able to express all the diversity of the enormous universal repertoire, a professional musician has to know how to control the quality of the sound, regardless of the instrument he’s playing. Piano is not an exception. The means and the purpose – technique and expression. However, we see so often pianists with excellent technical skills that are simply hammering at the instrument without thinking about the beauty of the sound, the meaning of a phrase, the concept behind a certain dynamic. There are many piano teaching methods. Each one has its strong and weak points. I have seen many times the following pattern: the student and the teacher get so involved in the process of overcoming technical obstacles, that they forget about the goal of their ‘quest’ – expression, meaning, music, art! Playing piano is not a sport. Nobody is interested in how developed your finger velocity is or how fast you can play scales, arpeggios and technical exercises. People want to listen to music that TELLS something, that reflects a certain state, a certain feeling, that brings them a new understanding of life and death, that gives them a purpose in life! When, after a concert, somebody from the audience comes to congratulate the performer and tells him or her ‘Thank you for this wonderful music!’, he doesn’t say it because he enjoyed pure technique and complicated tricks. He says it because the music has touched his emotions, has changed, even for a moment, the way he perceived the surrounding reality. Achieving good technical skills is not the purpose of piano playing. It is just the means that will allow you to express that concept, that feeling ‘encoded’ by the composer in his work. Velocity and technique should always be subordinate to meaning and feeling – this is one of the most important principles of the performing art, no matter if we play piano, violin, oboe or we sing. Let me give you a very simple analogy: people learn to talk not because they want to prove that they can move their tongue and their jaws in a certain way. People talk because talking, among other things, is a method of communication, of sharing thoughts and experiences. The piano keyboard and the dangers of the ‘percussion’ approach. The first mistake most piano students make is treating the piano like a percussion instrument. They pound on the keyboard without analyzing the quality of the sound, not to mention delicate dynamics, separating main and secondary voices or changing the touché depending on the character of the music. Work on the sound as well, not only on the technique! Mastering the sound requires lots of practice. You have to train your ability to influence the color, the depth, the openness and the softness of the sound by making subtle changes in the way you press the keys. You have to be aware that each note has to be ‘backed-up’ by the full weight of your hand. Many pianists, especially in the past, were playing by using only the separated action of the fingers. This limited approach has a detrimental effect on the sound. If your shoulders, your elbows and your wrists have a fixed position, the sound will reflect this forced tension. A few secrets that will help you avoid the percussion-like touché. When practicing, imagine that the piano keyboard is not a hard surface, but elastic and flexible: it can respond to the slightest fluctuations in the intensity of the applied pressure. Imagine that your fingers are ‘diving’ into the keyboard, not hitting it like hammers. Your back, your shoulders, your elbows, your forearms and especially your wrists have to be totally relaxed. All the weight of your hand has to have a single support point: your fingers. I always tell my students that their hands should be like a cat’s paw: soft, relaxed, flexible. Their fingers, though, should be like the claws: sharp, having a brilliant articulation and, as Heinrich Heuhaus used to say – ‘always ready for battle!’. However, beware of allowing your fingers to be ‘in charge’. They are only the continuation of your arm, which, in its turn, is the continuation of your shoulders and back and, ultimately, of your mind and your feelings. The free pressure of the entire weight of your hand, the controlled fingertips and the relaxed wrists (which will compensate and soften the pressure) will make the pianistic sound deep, free and expressive. Only such a sound will allow you to create a good legato and a meaningful flowing phrasing. I will write more in my next articles about the negative influence of the ‘percussion hit’ sound on the legato and the ‘horizontal’ long phrasing. I’ll also explain (and demonstrate in a few video recordings) another key principle of the Russian piano school: the ability to ‘sing’ at the piano. I usually tell my students that martial arts, especially aikido and jiu-jitsu, are a good source of inspiration: brutal force and tensed technique will not have any results. Only a relaxed approach will allow you to use your opponent’s strength and turn it against him. Interpretative art is based on the same principles: controlled relaxation, achieved with hard work and awareness, will result in a quality sound and a brilliant technique capable of expressing the most complicated musical ideas. That’s why you should always pay attention to the quality of your sound, even when you’re playing scales, practicing some difficult technical places or just warming up. Be aware that a true musician is playing with his soul and his mind, not only with his fingers. At the same time, don’t forget about your ear training: never play mechanically, always listen to the objective quality of your sound! For having a fulfilled piano career, for being able to express the entire complexity of the wonderful pianistic repertoire, a piano student should understand from his first lesson how important is to combine technique and expression in his daily practice. “Bravo”…………very inspiring…….I have been searching for a very long time someone who can communicate what we need to work on as musicians. I’m glad you have taken the time and effort to assist those who are searching for that ‘something’ to improve and excel. Thank you for your comment! I’m glad if my articles will be able to help you in your piano practice :). I hope that you’ll like my next posts as well! I have been reading your blog for the last few minutes and am already hooked ! I learned to play the piano as a child (from enthusiastic but untrained teachers), had to stop playing for almost a decade (life was such), resumed a couple of years ago and nearly killed my wrist with the ferocity of my practise (so desperate was I to make up for lost time). I am going to follow your statement ‘better 1h every day than 5h 2-3 imes a week’ and hope to slowly regain my proficiency. Eagerly awaiting your video lessons which will teach us how to let our ‘wrists breathe’. Keep up the good work ! Thank you for your comment! In piano practice (just like in all the areas of our life), the most important thing is to have a well-determined goal and to move, step by step, towards reaching it. Small, mindful steps are many times better (and healthier!) than strenuous efforts that could jeopardize everything you’ve already accomplished. Such efforts may sometimes be necessary, but only if the hands of the pianist are in a very good, trained shape, and he/she can feel the reasonable limits beyond which lies danger. P.S. I hope to start working on those videos soon! I just happened across your site and have enjoyed it thus far. It just so happens that I am recovering from a piano injury at this very moment. I injured the brachioradialius in my right forearm playing a poorly regulated baby grand piano. So far, so good – after ten sessions of physical therapy. My main weakness is that I started as an organist. I tend to hit the piano keys too hard (a habit I developed because I subconsciously was trying to get the notes to sound longer as they do on organ). I’m intrigued by your approach of not playing the piano percussively. I just finished a gig this weekend. After three hours of playing, my fingers feel bruised and several of my fingernails are split underneath. Obviously, I still haven’t developed the right touch. I can’t reconcile the difference between hitting the keys hard enough to produce a sound and hitting the keys too hard. Any advice? Even if they’re both keyboard-operated instruments, the organ and the piano are totally different. Piano is a hammer-string instrument, while the organ is mainly a wind instrument. That’s why the playing principles should be totally different, especially when it comes to the quality and particularities of the sound and phrasing. Piano is the only instrument which cannot sustain long notes. After hitting the key, the sound is inevitable fading. That’s why it’s so hard to make the piano sound soft, melodic, expressive, legato. However, this is what piano mastery is all about – defeating the physical laws of the instrument and creating the ILLUSION that the note sounds longer than it’s actually possible and that a perfect legato is attainable. 1. The keys should NOT be hit! They should be ‘dived’ into, pressed gradually by using the entire weight of the arm (not the separate movement of the fingers). Imagine that you slowly press with your hand a soft pillow, or a water bed, or a piece of dough (whatever suits your imagination). Our objective is to achieve a gradual, soft and relaxed touche, as if the keyboard was not a hard surface, but a malleable, flexible one (like a soft ball). 2. The wrist (and the rest of the arm) should always be relaxed and extremely flexible. This will soften the force coming from your arms, making the sound noble, deep and expressive. All the practice-related pain and injuries come from a incorrect, tensed playing. 3. The fingers are only ‘support points’ which receive the weight of the arm, not the main generators of force. That’s why, if playing correctly, you should not experience a big discomfort in your fingers. Finger velocity and articulation are extremely important, but this should not be confused with the old-school technique of separate finger action. Of course, if a pianist is not playing for several weeks, he/she will feel some pain in the fingers when resuming the practice. However, the unpleasant sensations should disappear in a few days. If they persist, then you’re doing something wrong! One more thing – if you press (press, not hit!) the keys with a deep, heavy yet gradual and relaxed touche, the sound will last much LONGER than in case of a tensed, percussion-like sound! Even if words could never be enough for expressing the entire complexity of this technique, I hope this will be helpful! Good luck in your practice and if you have more questions – please ask! The idea of “pressing” the key is definitely a new one for me (no doubt one of the weaknesses of being self-taught on an instrument). I look forward to trying it out. What’s the best material for this – scales, arpeggios, songs? Scales and arpeggios are always useful (especially for technical purposes). However, remember that the most important thing is not WHAT you play, but HOW you play it. If your wrist is tensed while playing scales (this risk is especially big in arpeggios, where the fingers are wide spread and it’s more likely for the tension to occur), then instead of progress you’ll develop a hand injury! You can play some scales every day before your main practice. Start slowly, concentrating on the freedom of your arm and wrist and the deep, soft quality of the sound. Gradually increase the tempo only when you feel that all the tension is gone. Even if scales are useful, they are not enough for training a quality sound and a correct posture. Nothing compares to the benefits that Bach’s music brings us. It is a complex ‘treasury’ that teaches us everything: technique and sound, phrasing and understanding, musicality and good hearing. You can play something by Bach everyday, as an important part of your piano practice. When playing his music, try to imitate the sound of the voice or violin – long, relaxed, flowing, expressive. Always try to have this association when playing a melody on the piano – it will help you tremendously! If scales and arpeggios are useful mainly for developing our technique, then Bach’s (also Chopin, Rachmaninoff) music is perfect for teaching us how to have a beautiful, relaxed, professional sound. I’ve been reading on your website for a couple of hours now, and watching some of the videos. I am very impressed by the thoughtful advise and ideas you’ve put here. I can describe myself as someone who wants to play the piano very dearly, but not as a professional concert pianist! I guess it is just too late for that now (I’m 40!). I’ve been playing some keyboards for a while, in addition to some other instruments, but I’ve always wanted to be “good” at the piano. At least good enough to play nice songs, rearrange some songs in different styles, etc. I’m a big fan of the relaxation method for the full arm. But I want to know your views about how much relaxation and “diving” into the keys helps in the case of the Blues and Rock’n’Roll genres! I understand that these are not typically the styles of music that professional pianists play, but they are very sweet and musical, at least to me! I’ve noticed that many instructional videos that teach Blues, for instance, implicitly send a message that the fingers do most of the work! Stiffness in the hand is quite visible. It is nothing like classical music on the piano. If you ask me, classical music isn’t what I want to do. But is it really necessary to go through it in order to develop the more complicated piano techniques and skills, as well as feel, phrasing, etc? I’ve been practicing some Blues pieces for a while, and I’ve already developed finger pain, especially the right-hand pinkie. When I try to visualize the relaxed-hand-and-wrist technique to perform the Blues piece I’m working on now, it just doesn’t feel appropriate! So, I guess my question is this: Is classical music, on the piano, a totally different world than most other styles, such as Blues? You’re right – there is usually more arm and wrist flexibility involved in playing classical music (as compared to Blues or Rock). The reason is simple: most classical music is oriented towards the expressiveness of the human voice and its smooth cantability. The only way of achieving this effect on the piano is by playing from the weight of the entire relaxed arm, with flexible wrists and a ‘diving’ key attack. In modern music, however, the piano is ‘allowed’ to have a more ‘percussive’ sonority and the performers don’t feel the need of ‘softening’ their key attack with wrist flexibility and arm relaxation. However, let me tell you a secret: most classical performers can easily play modern music. Rock performers, on the other hand, usually can’t play classical music properly! You’ve noticed it yourself: playing with a stiff hand position is uncomfortable and often painful. It’s not necessary to go through classical music in order to be able to play modern music well. Still, you can certainly use classical playing principles for simplifying your practice, for making it more comfortable and productive and getting rid of tension! The quality of your performance will only improve as a result! Maybe it’s not 100% appropriate to play Blues with classical wrist movements. At the same time, practicing a Blues piece slowly, in a relaxed ‘classical’ manner will have amazing results – guaranteed!!! Then, after this kind of ‘tension prevention therapy’ you can go back to a more ‘modern’ playing habit – but you won’t feel pain and tension anymore! I am a teenager and have been playing the piano for almost ten years. I usually do strong stacattos on the piano to strengthen my fingers so i can control the strength at which i play the keys. If i play an arpeggio however, and i use too much force (from wrist and fingers) do you think that my fingers will gradually get strained? From your post I deduced that you’re practicing by using the old-school finger-only approach. In the Russian piano school, we use the whole-arm action principle – we play from the entire relaxed weight of our arm, keeping our joints (elbows and fingers) entirely relaxed and flexible. We never strike the keys with lots of finger force – instead, when we want to produce a big sound, we press them by using the entire arm weight! We always focus on a beautiful sound and we play even technical exercises in an expressive manner. Our fingers do not get strong by themselves. They get strong (which is important) by learning how to carry the weight of the arm. More information on this topic in my upcoming tutorial The Fundamentals of Scale Practice – it will be LIVE on my Piano Coaching Program at PianoCareerAcademy.com next week, on September 10th. This tutorial will be the 2nd episode of my project How to Practice Piano Scales and Arpeggios – The Art Behind The Exercise. The Introductory Lesson is FREE, while all the other episodes (where I will also demonstrate in detail how to practice arpeggios) will be posted on PianoCareerAcademy.com. You can also explore all my other free videos and articles here, on PianoCareer.com (to learn more about the professional principles of the Russian piano school) – and the hundreds of detailed tutorials that are available for the members of my Coaching Program :). Thank you so much for the wonderful tutorials, especially the part relating to the real meaning of obtaining a good piano technique – our ability to express emotions conveyed by the composition. I personally believe that music does start with scales and that listening to scale practicing can tell us a lot about the pianist maturity, ability to improvise and use the instrument as an organ of speach, because music is just another way of speaking. With that in mind I am against using the metronome except for the initial definition of tempo, which should never continue as an unchanged and mechanical way of interpretation, as our playing should resemble the way we speak, with all changes of tempo, pauses etc. Of course, this shouldn’t be taken literally, but in the contex of each particular composition. Insisting on using metronoms in order to teach students to “keep the tempo” actually kills the instinctive and natural approach to music we should otherwise cultivate. I think that you might also enjoy my free detailed article dedicated to the professional approach to developing a brilliant technique – you will find it under question No. 34 of our FAQs at PianoCareerAcademy.com (http://www.pianocareeracademy.com/faqs/). Regarding the metronome – I agree with you! I have several detailed articles on this topic (when, how and if we should use the metronome) in the Members Area of my Piano Coaching Program at PianoCareerAcademy.com. I really like your website and your excellent piano detailed teaching methods.. I just discovered it in my desperation as an older student. I played piano many years ago & stopped when I commenced with a career & with my adult life…..I have always loved the instrument as my mother was a wonderful pianist. Now in my sixth decade I am working very hard to become a good pianist. I have tremendous difficulty with attaining a soft /light piano touch. this frustrates me very much…the more I try makes it worse!! I love the way you play piano…it sounds so divine. In order to create a beautiful and noble piano tone (as opposed to a harsh percussive one) you need to learn the aural/technical/fundamentals that allow us to produce it in the first place: pre-hearing the sound in your mind (before touching the keys) – and then playing by using whole-arm action, weighted playing, wrist flexibility/relaxation and a gradual key attack. Otherwise, if you play by using the old-school ‘finger-only’ approach, your sound will remain harsh no matter how much you try :). In other words, Ilinca’s playing style is not a question of ‘talent’ – it’s simply the result of practicing according to the professional system used in the Russian piano school (a system that anyone can learn). 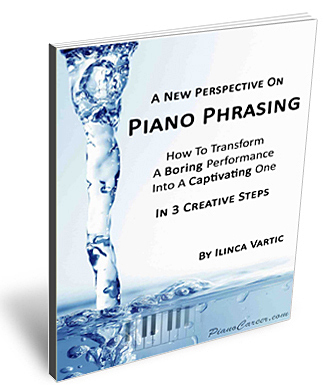 You can learn more by watching some of Ilinca’s free video tutorials (for example The 5 Basic Elements of a Correct Piano Posture, The Secrets of a Correct Piano Key Attack, The Piano Intoning Technique and the Illusion of Legato, The Key Principles of Correct Piano Practice: A Step-By-Step Holistic Guide) – and you can also learn how to play piano correctly, in a step-by-step manner, by following the tutorials available in the Members Area of our Piano Coaching Program at PianoCareerAcademy.com. By the way, I will quickly explain that PianoCareer.com is Ilinca’s free piano blog (where she posts a new video or article about once in 6 months, when she finds some free time). 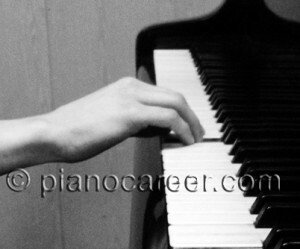 PianoCareerAcademy.com is her paid Piano Coaching Program – offering its members many hundreds of super-detailed tutorials (including step-by-step courses and unique interactive projects) structured according to Categories and Levels – all of them focused on the professional principles of the Russian piano school. No. 17: a detailed description of our Video Course for Beginners (in case you wish to re-learn the fundamentals correctly). No. 22: find out how much practice is needed for reaching your individual piano goals. No. 23: find out if you can become a good pianist after a certain age. Also, please feel free to take a look at any other FAQ that might interest you, before registration.